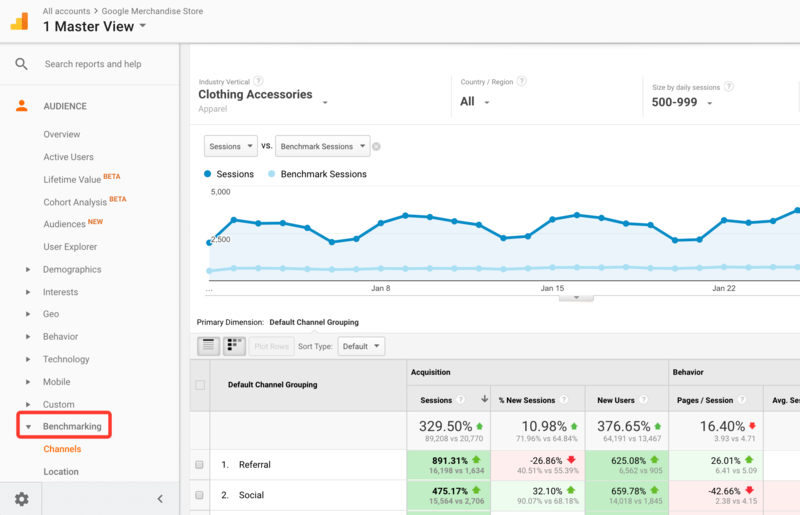 Google Analytics benchmarking reports allow you to see how your website is trending in your industry. The data in these reports show you how well you’re competing across traffic channels. Not only that, but you can also see which user devices are the most popular in your market and you can learn where your website trends on a global scale. In this post and video, we’ll take an in-depth look at the benchmarking reports. 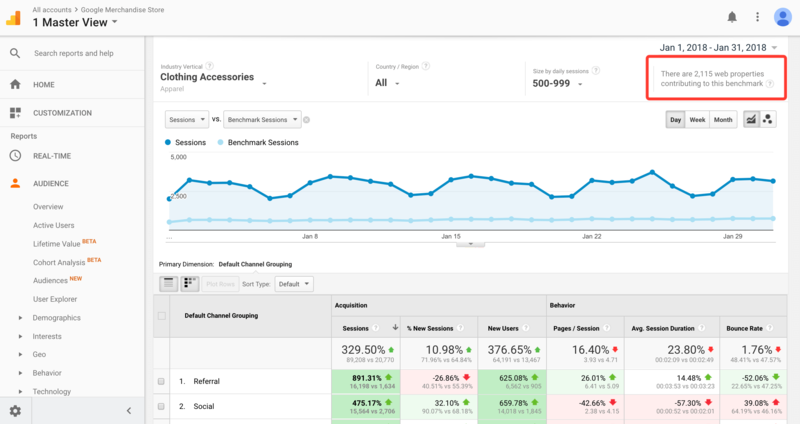 Follow along, and learn how to do competitive analysis using Google Analytics benchmarking. 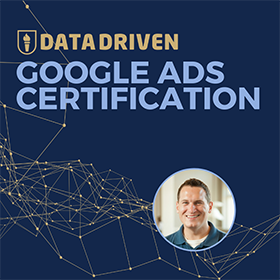 Let’s start with understanding where Google collects this data. The benchmarking reports use anonymous data from other websites. These reports allow you to see how your marketing is performing against the aggregated data of other analytics users. Installing benchmarking is as simple as clicking a button. To setup benchmarking, navigate to the admin section of Google Analytics. Then, in your account settings check the “Benchmarking” box. Figuring out how to use your benchmarking reports can be a little confusing. But it just comes down to finding the right data for your traffic comparisons. Dave from our Analytics Course, asks a pervasive question about benchmarking. Is there a way to filter the types of web properties Google is comparing too when I benchmark? Perhaps by industry? Let’s answer Dave’s question and learn how to use these reports. You can find the benchmarking reports under the audience tab in your Google Analytics account. Your benchmarking reports include three types of reports. Adjusting the filters is how you find the right niche for your traffic comparison. 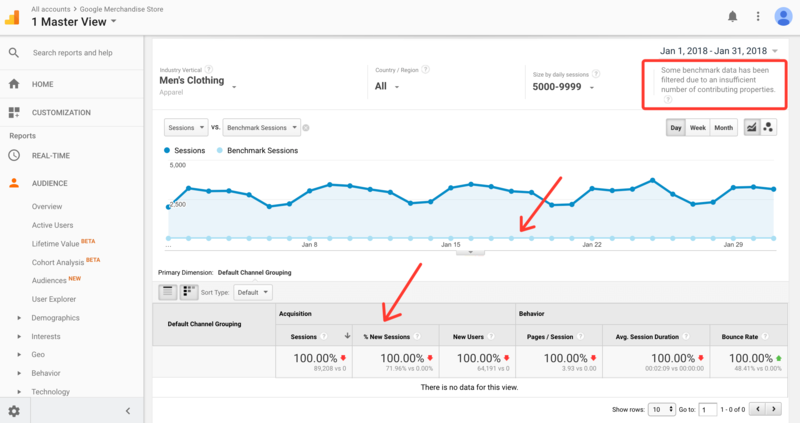 In this example, I am using the Google Analytics Demo account to show you how benchmarking works. 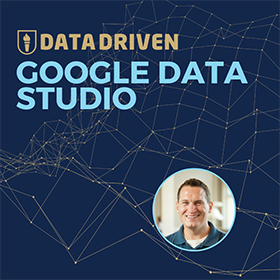 This Demo Account uses data from the Google Merchandise Store (GMS). Since I am using the GMS account, I have chosen the “clothing Accessories” vertical. And I am making a traffic comparison based on sites that get 500-999 visits a day. Using the filters allows you to be more targeted with your competitive analysis. But it also decreases the amount of data available at each level. Google shows you how many web properties you’re comparing to each time you filter your report. If you filter too precisely, Google may not have enough data to display a report. 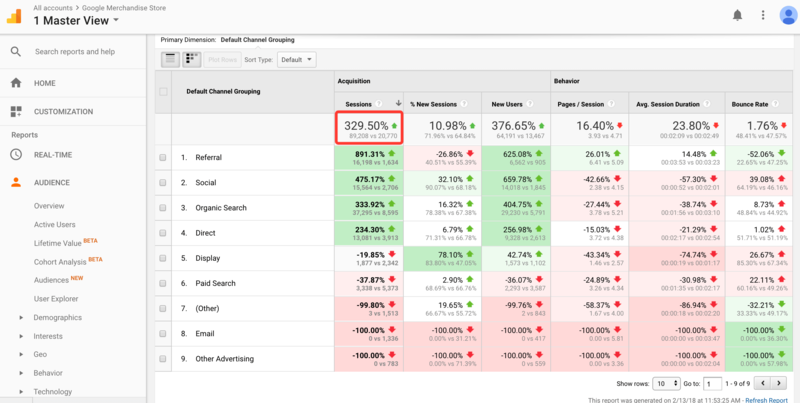 The first (and most useful) option in your benchmarking reports is to compare your traffic by channel. 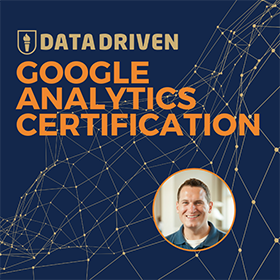 This report uses the default Google Analytics channel grouping to measure your data against your industry. Your traffic channels that are performing above industry standards display in green. Traffic channels below the industry trend appear in red. The percentages show you how much your site is trending above or below the averages. It’s important to try to measure your site against competitors that get similar amounts of traffic. The GMS is over-indexed in the first comparison I selected. We need to choose a higher daily traffic level to see a meaningful report. Bumping up to 1000 to 4999 daily sessions level allows us to make a better traffic channel comparison. The location report allows you to view your industry data by country. I don’t find much utility in this report because most websites target a specific region. 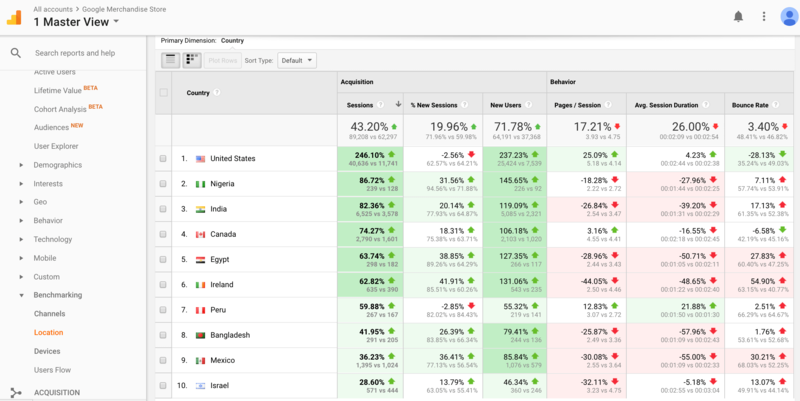 If your site focuses on customers in the US, then international traffic is mostly irrelevant. Same goes for whichever country you are located. Also, you can do a more specific location comparison using the County/Region filter. But if you work for a large multinational corporation, this report could be useful. 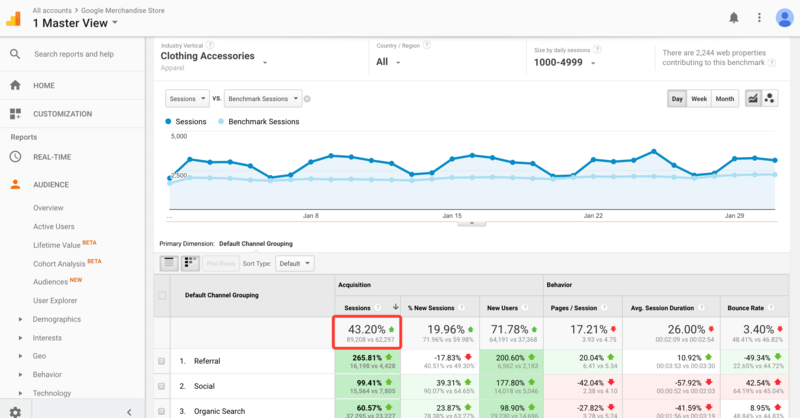 The devices report shows which users devices are getting the best traffic numbers in your market. 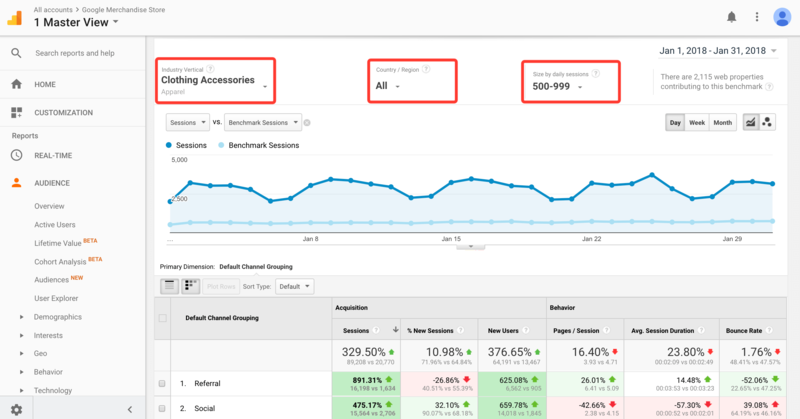 You can evaluate your traffic on desktop, mobile, and tablets. This report is relatively useful because it allows you to learn about user device trends in your industry. You can see which devices are favored by customers in your niche. Then you can tailor your site design to meet those preferences. Put your benchmarking data into context! I love the benchmarking reports. But, keep in mind these reports are not much use without context. Fair warning, I am about to go on a bit of web analytics rant. If you want to hear my full rant, watch the video above. Here’s an example of what I mean by context. Let’s look at the benchmarking channel report for the GMS. The GMS significantly outperforms the industry standard for referral traffic. If you read our post on cross-domain tracking, you would know the answer. The GMS gets most of its traffic from YouTube and other Google-owned websites. Their approach to customer acquisition is entirely different than the rest of their industry. The GMS gets high-value traffic from other Google sites that have millions of daily visitors. Without context, the overperforming referral traffic appears out of place. With meaning, we understand the GMS is leveraging a competitive advantage. Make sure you add context to you benchmarking data. Think about why your site might be above or below industry standards. Do these metrics indicate that you need to make changes? Or do they show that you’ve strategically prioritized specific traffic channels above others? 1) Setting up benchmarking is easy. Enabling this feature is as simple as clicking a button in your account settings. Use the filters to find the right category for your traffic comparisons. Adjusting the filters will have a significant impact on the trends you see in your reports. I find the traffic channels report to be the most useful, by far. The user devices report can also be helpful. I almost never use the country report. To get enough data to run these reports, you need to stay broad. If you get too specific with your filtering, Google can’t run your report. So, keep in mind you are looking at trends. Benchmarking reports provide general information about industry segments. The general industry data you get from the benchmarking reports can only tell you so much. You need to combine this data with other sources of information to build a complete picture. You can use tools like Similarweb and Spyfu to help you learn more about your benchmarking trends. The video below walks you through how to use all three of these tools to build a competitive marketing budget. Don’t rely on benchmarking as the sole source of information for your competitive analysis. Benchmarking is a great starting point for looking at trends in your market. But this shouldn’t complete your analysis. You need to dig deeper, add context, and bring in other reports to find real meaning in these trends. Do you use the Benchmarking reports? 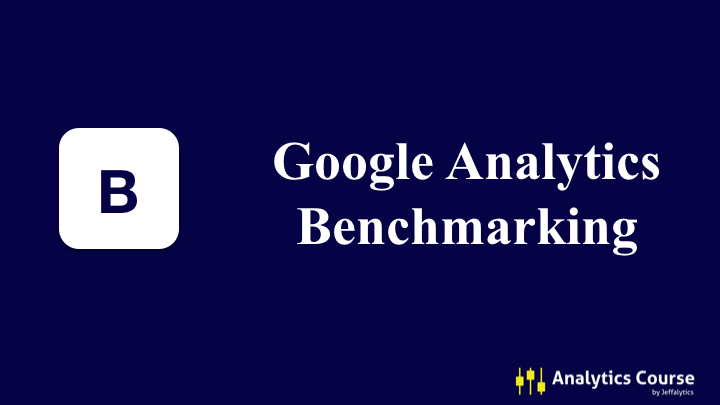 What do you think of the Google Analytics benchmarking reports? Do they help you improve your marketing? Or your website? Leave a comment below with your thoughts on the benchmarking reports. This post and video was episode 32 in our 90 Day Challenge digital marketing series. To get access to all 90 days of videos, subscribe to our YouTube channel. YouTube will send our subscribers weekly emails about all the videos we published over the past week.